Notes on construction out of commonly available parts: In general make the bottom boiler pot about 3 times smaller in capacity than the top pot. This will insure the top heats up to max before the bottom runs out of water. This assumes one fills the bottom about 2/3 or more of its height with water before starting. It is important that the bottom boiler pot have a lid that fits snugly (doesnt let steam out easily). The lid should be rounded such that it is higher in the center than the edges. The lid should not be made out of glass but be made of some metal that allows for ease of making a large hole in the center. I found between 4 and 4.6 quarts to work well for the bottom pot. The diameter of the bottom pot is not two important as long as it is stable when in use (wont easily tip over). Typically it is 8 to 10 in diameter. If you use much bigger than that it tends to interfere with the output pipe coming out the side of the pie pan. The diameter of the upper pot is constrained by the choice of the pie pan and turns out to be about 10 to 10.75. The top pot needs to end up stable and held into place so will not easily slide off. Height of each pot is not too important. I found between 12 and 16 quarts capacity to work well for this pot. I used it without a lid. Dont plan on anything much bigger than this it is too dangerous too move when empting. It is heavy and the water will slosh if you move rapidly. Warning: Scalding hot water accumulates in the top pot during use. Empty it with extreme care. I used leather gloves and moved extremely slow. This pot is heavy. If you have it -- wear water repellent heat protective clothing possibly an apron in case this accidentally spills in the process. The choice of the pie pan is important in that one needs to solder to it and the extra extended lips on the Pie Pan helps to hold the upper pot in place. The sides being tapered help point the output pipe in the right direction See the photo at top. With added soldered on flanges I believe in a pinch any pie pan would work. Light weight Construction: (for back packing use. Total weight is 2 lb 5 oz. see photos on previous page). Note: Being light and portable these pots above are very soft and will bend easily. One should take care to insure this does not happen. I then found some pots made out of SS and thicker aluminum. It end up being a little more than twice the weight but is defiantly more durable. 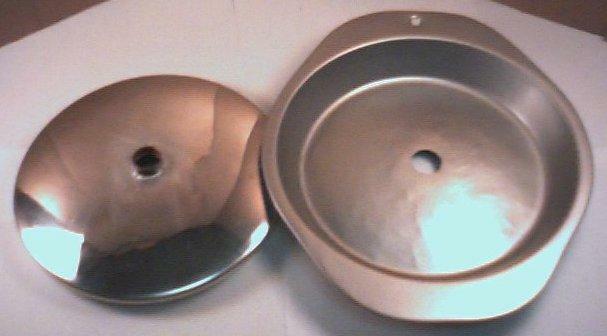 Top pot: Aluminum Covered Saucepot diameter 10.75 by 7.5 high (12 Qt/11.4 L) from MIRRO Co. P.O. Box 1330. Manitowoc, WI, 54221-1330 (mfg. No. C-7962) Cost was $7.99 (from Big Lots a local store). Weight without lid is 14.5 oz. 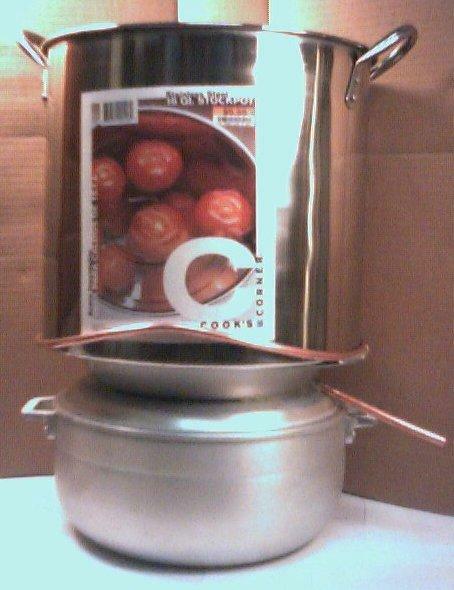 Bottom pot: Aluminum Covered Saucepot diameter 7.75 by 4.8 high (4 Qt/3.8 L) from MIRRO Co. P.O. Box 1330. Manitowoc, WI, 54221-1330 (mfg. No. C-7974) Cost was $7.99 (from Big Lots a local store). If needed the side handles can be unscrewed and taken off for use with a camp fire. Weight without lid is 8 oz. Heaver duty construction: (for stable location or back pack use. Weight about 4 lb 14 oz.). See photo at right. Top pot: Retail Sales Link, Inc. Agora Hills Ca 91301 item number 104-16 QT. A Stainless Steel 16 Qt. Stockpot for $5.99 (from Big Lots a local store). Weight without lid is 2 lbs. This is the best of what I tried, if you can find it. Alternative Top Pot: Kirby & Allen 12 Qt (11.4L) Stainless steel steamer pot with steamer plate. Cost $9.99 from Big Lots # 103902. 1332 Livingston, Avenue, North Brunswick, NJ 08902. Weight 1lb 14 oz. Bottom pot: Bene Casa Coldero no. 7 model: BC-17280 4.6 Qt/ 4.5 Ltr Made from Sheeted Aluminum with Mirror Coated Finish. Cost $11.99. This pot measure .1 thick aluminum. Weight is 1 lb for lid and 1lb 15 Oz for pot. This is the best so far, if you can find it.